How Gospel Conversations with 7th Day Adventists Led to Research about Michael, the Archangel, as the Pre-Incarnate Christ and to . . . John Calvin? What?! Three months ago, over a third of our church participated in Unlock 2013: Asking God to Open Hearts in DFW. I had the privilege and opportunity to lead this ministry and all of our Unlock Workers that consisted of an evening VBS, a free meal, prayer groups, sports camps, lots of organizing, administrating, and publishing, evangelism teams and prayer stations in the streets and parks of Dallas, and now – follow up for discipleship. We had over 620 gospel conversations with folks in Dallas, and we’re excited to evangelize more and become better equipped at discipleship. This whole thing launched out of a renewal that is taking place at our church to grow by worship, prayer, conversion/the new birth, and discipleship as opposed to the ever popular mantra of “Hey, come to our church because we now have the latest, biggest, and best programs.” We want to worship, pray, and proclaim the gospel and watch the Holy Spirit work in power. As our teams were out in the streets and parks, some encountered 7th Day Adventists. Honestly, I did not know much about the Adventists. After having done some research, I will suggest that their openness to prophecy and the authority that they give to the writings of Ellen White are troubling. Also troubling is their inability to see that the Law was entirely fulfilled in Christ, including the Sabbath. Their position on the Sabbath leads them down strange roads as expressed in this recent article from Ted N. C. Wilson, the President of the Seventh Day Adventist Church: http://www.adventistworld.org/issue.php?issue=2013-1009&page=8. Is Michael, the Archangel, Jesus Christ? During my research on the 7th Day Adventists, I came across a very interesting view on Michael, the Archangel, that I had never heard before. They believe that Michael, the Archangel is another title for Jesus Christ. Michael means “who is like God.” Archangel could mean, “highest ranked angel,” or “ruler of the angels,” or “chief of the messengers.” Context must help with the interpretation. Let me be entirely fair, they DO NOT believe that Jesus Christ is or ever has been an angel. They believe that Michael when mentioned in Scripture is NOT an angel, but it is Jesus Christ, the ruler of the angels. Now, whether or not such an interpretation is plausible will take more thought and work on my end. My initial judgment is that such a view is confusing rather than clear, and we do not ever have the New Testament writers clarifying this for us. In fact, Michael appears in the New Testament, and in my opinion, it becomes more clear in those passages, that Jesus Christ and Michael are two separate beings. Commenting on Daniel 10:13, Calvin writes, “He adds next, ‘Behold! Michael, one of the chief leaders or princes, came to strengthen me.’ Some think the word Michael represents Christ, and I do not object to this opinion. Clearly enough, if all angels keep watch over the faithful and elect, still Christ holds the first rank among them, because he is their head, and uses their ministry and assistance to defend all his people. But as this is not generally admitted, I leave it in doubt for the present, and shall say more on the subject in the twelfth chapter” (Calvin Commentaries: Daniel 7-12 & Hosea, XIII, page 253). Commenting on Daniel 12:1, Calvin writes, “By Michael many agree in understanding Christ as the head of the Church. But if it seems better to understand Michael as the archangel, this sense will prove suitable, for under Christ as the head, angels are the guardians of the Church. Whichever be the true meaning, God was the preserver of his Church by the hand of his only-begotten Son, and because the angels are under the government of Christ, he might entrust this duty to Michael” (Calvin Commentaries: Daniel 7-12 & Hosea, XIII, page 368-69). He seems uncertain about the whole thing really. Calvin also writes in his 65th lecture, which followed the above quotation, “As we stated yesterday, Michael may mean an angel; but I embrace the opinion of those who refer this to the person of Christ, because it suits the subject best to represent him as standing forward for the defence of his elect people” (Calvin Commentaries: Daniel 7012 & Hosea, XIII, page 369-70). I could . . . not . . . believe it. It’s not that I sense orthodoxy is at stake if someone holds to such a view, especially as expressed here by Calvin. It’s just a thought that I had never heard of until recently, let alone a thought that I have entertained. Yet, many of us would identify the angel of the LORD in the Old Testament as the pre-incarnate Christ. I am not so sure about that now, but I once held to that with no problem at all, and I still don’t think such a belief is too big a deal. However, when you read Calvin’s commentary on the epistle of Jude, he mentions no connection between Michael and Jesus Christ, and in fact, I would say that there is no way that Calvin sees Michael as another title for Jesus in Jude 9, “That Michael is introduced alone as disputing against Satan is not new. We know that myriads of angels are ever ready to render service to God; but he chooses this or that to do his business as he pleases. What Jude relates as having been said by Michael, is found also in the book of Zechariah, ‘Let God chide (or check) thee, Satan.’ (Zech. iii. 2.) And it is a comparison, as they say, between the greater and the less. Michael dared not to speak more severely against Satan (though a reprobate and condemned) than to deliver him to God to be restrained . . .” (Me commenting on Calvin Commentaries: Hebrews, I Peter, I John, James, II Peter, Jude, XXII, page 439). So, it seems that something happened in Calvin’s understanding of Michael, the Archangel, between his writing on Daniel and his writing on Jude. I looked at Hebrews to see if he said anything about it on Hebrews 1, where Christ is taught to be superior to the angels, but I did not find anything. I have not yet checked his comments on Revelation 12, where Michael is mentioned once again. I am not sure what exactly catalyzed the turn around. An interesting ride though. Thanks Mr. Calvin. *Update* I recently discovered – and I think that this was news to me – that John Calvin did not write a commentary on the Revelation of Jesus Christ to the Apostle John. Most with whom I have spoken or whom I have read state that he simply ran out of time in his life to write said commentary. This news then caused me to inquire as to what was the final word of John Calvin on the issue raised in this article; that is, which was written later—his commentary on Daniel or his commentary on Jude? One may assume that Calvin wrote his commentaries in order, working his way from the Old Testament into and through the New Testament. However, this is not what we find when we search the dates as recorded in Calvin’s commentaries. According to page lxxv in his introductory material to his lectures and commentary on the book of Daniel, Calvin signed a letter that included his provenance and the date, which were Geneva, August 19, 1561. He did the same for his commentary on the Catholic Epistles, which included the book of Jude. His provenance and the date for this writing were Geneva, Jan. 24, 1551. This means that what John Calvin wrote about Michael, the Archangel in Daniel CAME AFTER what he did or did not write about Michael, the Archangel in Jude. Therefore, the conclusion I think we must draw from the matter at hand is that John Calvin did indeed believe that “Michael, the Archangel” was another title for the second person of the Trinity. Calvin believed that the Son of God, Jesus Christ, was also the “One like God” who is also the “Captain of the Angelic Messengers and Host.” Although, let it be clearly stated here that John Calvin DID NOT believe that Jesus Christ, the second person of the Trinity, was a created, angelic being, but rather the commander of the angels. In holding his position here, he does not succumb to the Arian heresy that “there was a time when the Son was not.” Calvin believed in the eternality of the Son, that he has no beginning and he shall have no end. In my opinion, I think that Jude should be most informative to our understanding on this matter. First, it seems odd that after the incarnation of the second person of the Trinity such a title would continue to be employed. Second and more troubling, the Michael of Jude seems sheepish in his confrontation with Satan. If this is indeed an angel, I can completely understand his deflection to have the Lord rebuke Satan. However, it is difficult for me to comprehend a post-resurrection and ascension Christian writer reflecting on an event in the Old Testament in such a way that paints Jesus Christ in such a way. Now, I said difficult, not impossible. 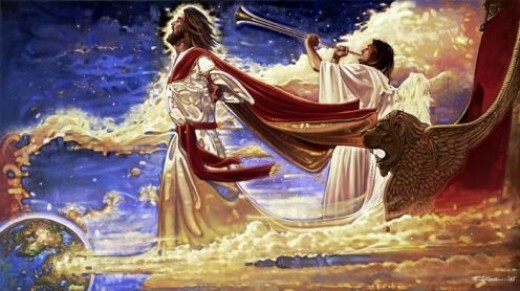 I can see how some may point out that (1) this is an event in the Old Testament and historically preceded the incarnation, death, resurrection, and ascension, and (2) we observe Jesus Christ, even in his incarnate state, in his encounters with Satan and with spiritual warfare appealing to the word of God and to the Father through prayer and fasting. This reveals the inner fellowship and relationship of the Triune God with a common mission and a common glory as well as the faithfulness of the Lord Jesus as the second Adam, as the faithful Man. So, it is not impossible for us to understand Michael in Jude the same way that Calvin understands Michael in Daniel. Thus, I conclude that — hey — I don’t like it. I don’t like the idea. Yet, I can understand how someone may arrive at such a position. I am not ready to embrace it, nor do I think that there is any benefit in embracing it. I still think that it breeds more confusion than help for whether “Michael, the Archangel” is another title for the second person of the Trinity or not, whether it is a title given to him to emphasize his leadership over the angelic host or not, it remains true regardless that all creation is under his authority. He has been given this by the Father, and a special title is not necessary for this truth to be true. and all things are held together in him (Colossians 1:15–17).